Hello! This week has been one of those weeks where I don't feel like making a whole lot of stuff and taking pictures of it. I love creating, but ya, even I need breaks once in a while. So luckily, I put together this little project and tutorial for you last week. So here is my new memo board...made from a thrifted picture frame, cardboard and canvas. Entirely free for me to make because I had all of those things at hand already! Step 1: Cut and fit some thick cardboard into the frame. Step 2: Lay the frame face down on the canvas and cut a few inches around the borders. Step 3: Fold the canvas over one of the sides and staple it in the center of the length of that side to secure it to the frame. Step 4: Fold the canvas over on the opposite side of the frame and stretch tightly. Staple again in the center of that side. Do the same for the other two sides of the frame, stretching tightly each time. Now your frame should look like this.. with one staple in the center of each side. Step 5: Continue to staple the rest of the canvas onto the frame, working from the center out and alternating sides. Remember to pull the canvas tightly each time. This process is what is known as in the art world as "stretching a canvas"... a little skill I learned in my oil painting class. cool huh? The goal is to stretch the canvas as tightly and evenly as possible, but for our purposes here, the tightness and evenness don't matter quite as much. Step 6: Time to finish off the corners....fold the canvas over so that it looks like the picture below. I can't quite explain how to get a straight clean corner. I had to play around with it for a while to get it straight. 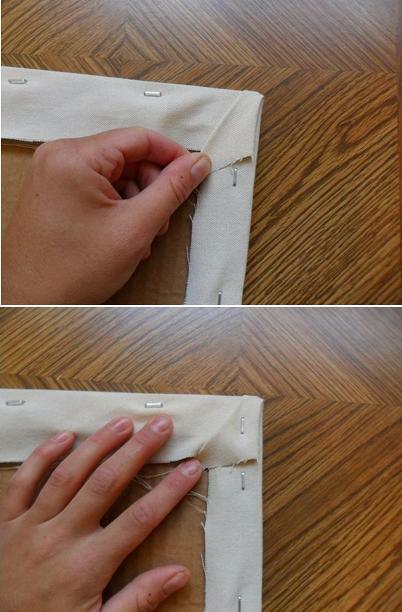 Once you get it folded over, hold it down tightly and staple it down. Now go find a nice spot for it in your house... my spot happens to be the kitchen. The kitchen is always the center of our house, so this is where my board goes. It's working out nicely so far! You just gave me the best idea! :)... Thank you so much!.. I'll make one for my crafty nook to help me stay inspired.